Green Cat Collective's Sand Noise Device in action. For every innovative idea, there's the place that brought it all together. For CSU East Bay students Matt Roads, James Saxon, Devin Dominguez, and Jay Van Dyke, it was the downtown Hayward bar The Bistro, just downhill from their school. That's where they first conceived of an interactive art piece that functions like an analog synthesizer — only with more playful controls. Just over a year ago, the group, now known as the Green Cat Collective, then students at CSU East Bay's Masters in Multimedia program, one of very few offered in the country — were tossing around ideas for their final project, and, ultimately, a ticket to fulfilling the requirements for their graduate degree. Roads, Saxon, and Dominguez are all musicians who have studied everything from performance to ethnomusicology for their undergrad degrees. 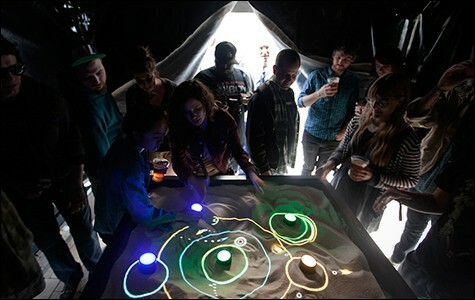 Their project, the group decided, would be an interactive synthesizer, inspired by Silver Apples of the Moon, the 1968 opus by innovative electronic composer and early Bay Area experimentalist Morton Subotnick. It had to be a tactile device that impressed professors and the public alike. They settled on the Sand Noise Device. Saxon, who was also working as East Bay's Photo Lab Manager, built the physical foundation using a custom sandbox and lighted, hockey-puck-shaped triggers. "Having real objects as a reference was very valuable, but it sometimes required stretching my abilities a little," he said. "Devin made the offhand comment that he would like to see one of the glowing pucks with a domed face rather than a flat one. I never would have suggested such a thing because I didn't know how to make it happen. Once he said it, though, I knew I had a new thing to learn." Dominguez spearheaded the pro-gramming portion of the project. He used OpenFrameworks to interface with a Microsoft Kinect pointed above the sandbox, tracking its topography, the colors of the pucks, and their visual output. Dominguez also used Pure Data and other open-source programs to synthesize the audio and provide graphics that follow the contours of the sand. 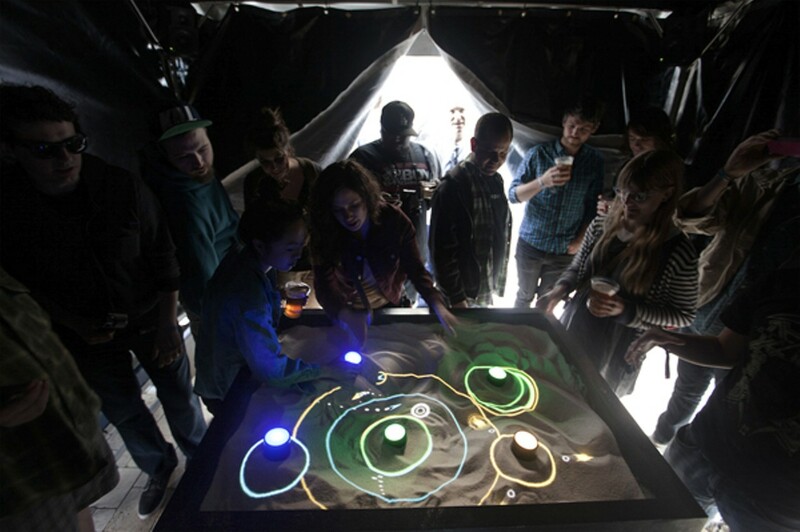 A projection is displayed next to the Kinect for visual feedback as well as to illuminate the sandbox below. Van Dyke also contributed to programming, an experience that he considered invaluable. "Being willing to give up control of something that my name will go on is very difficult for me," he said. Still, Roads, Saxon, and Dominguez are ideal collaborators, he said. "In all the projects I worked on at CSU, the ones that were the most successful and polished ... involved at least one of these three guys. I was constantly reminded that these guys had skills in areas that I lacked and I wanted to learn more about." That mastery and attention to detail are what ultimately brought the Sand Noise Device to Moogfest in North Carolina, a premiere annual event for experimental and electronic music. It was chosen as one of six featured installations, and the event took the Green Cat Collective across the country and exposed their project to new teachers, artists, and visionaries — and national media. "We had people who were educators — professors from Brazil — who came up and talked to us," said Roads. "We got to hang out with [musician and composer] Dan Deacon for a while. It was really cool to see repeat users, people who came from the first night's VIP party, and wanted to see more." The Green Cat Collective celebrated the one-year anniversary of the device's conception at The Bistro. A month later, they brought it to the Bay Area Maker Faire. Though the initial seeds were planted at The Bistro, last year's Maker Faire fostered their growth. A curriculum requirement that drew the students further into the world of high-concept DIY, the Maker Faire served as a means for the Green Cat Collective to gather feedback from fellow and former students showcasing their Masters in Multimedia projects. The group now looks to take the project even further, and is trying to crowdfund a trip to the country's biggest Maker Faire, in New York City. On top of successfully bringing their idea to fruition, the students had their project approved and have officially graduated. Naturally, they'll be celebrating at The Bistro.